I bet you just cringed. There is no way you’re going to take a perfectly good bowl of ice cream and douse it in vinegar. Too bad. You don’t know what you’re missing! Of course I am not talking about any old ordinary vinegar. This stuff is special and tasty enough to drink right out of the bottle. I know you don’t believe me so I’m going to show you the labels on the bottles. When my friends were here for the sandwich party we used a bit of the Cherry Balsamic vinegar as dip for our fresh fruit. It was heavenly on the pineapple! And for dinner tonight Amoeba and I enjoyed a mixed baby greens salad with dried cranberries, pecans, and Cherry Balsamic vinegar. We loved it. Last week we had spinach salads, as suggested, and that was yummy, too. Now, back to the ice cream — night before last I put just a splash, maybe a half teaspoonful of the White Balsamic Vinegar with Peach on my half cup of ice cream. It was yummy. Tonight I got adventurous and mixed a teaspoonful of Special Dark Chocolate Ice Cream Sauce with a teaspoonful of the White Balsamic Vinegar with Peach and drizzled that over my ice cream. My taste buds danced with joy. 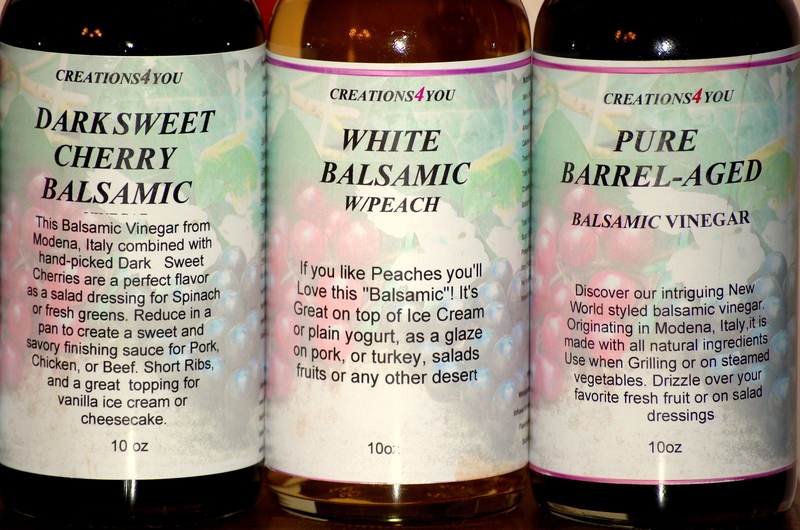 If you are interested in trying these vinegars for yourself, visit Rhonda at Creations4You.com. You’ll notice she has a long line of products. Stay tuned because I have just started talking about them and I have lots more to say! Balsamic Cherry vinegar ?? Never heard of it ! I always use the normal Balsamic vinegar I mean the red one, because there is also a white one, it comes from Italy but not with cherries or other added things. But the most important is that it was yummy ! We had a friend who ate Gorgonzola cheese with chocolate, so why not icecream with vinegar, lol ! Cut strawberries in half. if they aren’t really sweet add just a teeny sprinkle of sugar. Marinate in aged balsamic vinegar (the thick kind) for 15-20 minutes. It creates a most amazing sauce with the juice out of the strawberries, Drizzle over good real vanilla ice cream (that cracks me up – like I’m going to tell you to use crappy or imitation vanilla ice cream). Oh man…. now I need to go get some strawberries! Hmmmm, sounds different. Never knew vinegar could be sweet tasting. That just messes up the whole idiom “it’s easier to catch flies with honey than with vinegar”. There is a faboo lil kitchen shop in La Conner that sells some great balsamics along these lines. Had some on fruit last time I was over there on a motorcycle explore with a pal. I like ketchup on pizza, so I’d give it a try! There is nothing like a really great quality balsamic vinegar! I cook with it all the time. Have not considered putting it on ice cream… but sounds ok! Now you have ‘invented’ sweet and sour ice cream. We heard it first here! replaced the fourth at times. Forgot to mention that there would be other items added. Like green pepper pieces, onion, almond slivers (I can not longer eat them), pimento pieces, etc, it didn’t really matter and would be a reflection of my mood for the day.